Should You Work with an Exclusive Buyers Agent in NYC? Some real estate brokerages will try to advertise themselves as an exclusive buyers agent as a gimmick to win more business. The rationale of working with a home buyers agent that exclusively works with buyers versus sellers is that supposed conflicts of interests will go away. 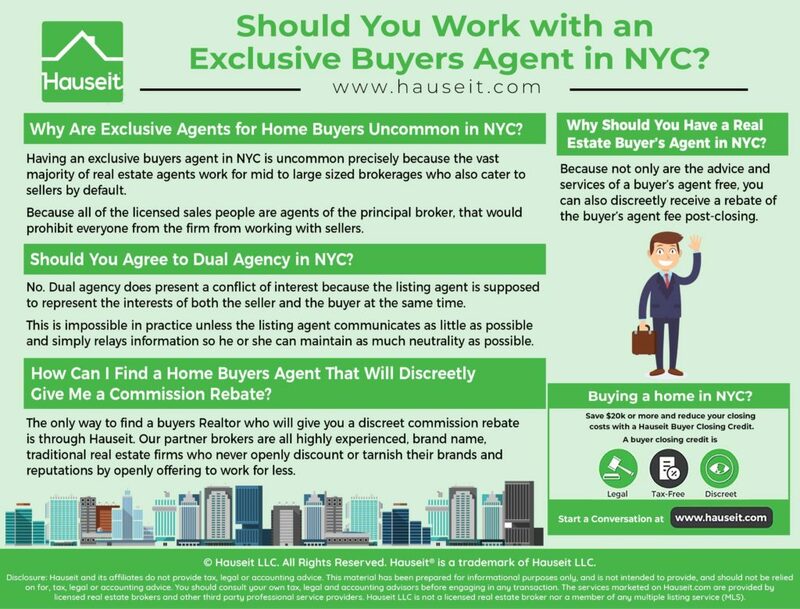 We’ll explain in this article why having a buyers advocate who doesn’t have any sell side listings is an unnecessary precaution and why it’s quite uncommon to have an exclusive buyers agent in NYC. Why Are Exclusive Agents for Home Buyers Uncommon in NYC? 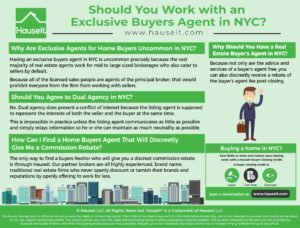 Should You Agree to Dual Agency in NYC? Why Should You Have a Real Estate Buyer’s Agent in NYC? How Can I Find a Home Buyers Agent That Will Discreetly Give Me a Commission Rebate? Having an exclusive buyers agent in NYC is uncommon precisely because the vast majority of real estate agents work for mid to large sized brokerages who also cater to sellers by default. A brokerage that is anything more than a one man shop cannot decline to serve home sellers if they want to stay in business. Remember that having an exclusive buyers agent means the principal broker cannot simultaneously represent a seller. Because all of the licensed salespeople are agents of the principal broker, that would prohibit everyone from the firm from working with sellers. This is obviously quite unrealistic for any firm that has more than one or two people. Think about it, why would any real estate agent join a firm that denies everyone at that firm from working with sellers? What if an agent gets a seller referral worth the typical 6% commission to sell? There’s no way that an agent would turn away that kind of upside by sticking with a firm that only exclusively works with home buyers. As a result, a self-purported exclusive buyers agent will truly be a one man shop typically consisting of the principal broker only. Just because having an exclusive buyers agent who refuses to work with sellers is overkill doesn’t mean you should agree to dual agency and work with a listing agent directly. Dual agency does present a conflict of interest because the listing agent is supposed to represent the interests of both the seller and the buyer at the same time. This is impossible in practice unless the listing agent communicates as little as possible and simply relays information so he or she can maintain as much neutrality as possible. A listing agent who doesn’t speak will not be helpful to either the buyer or seller, and will be even more overpaid than normal for doing nothing! You can still work with a seasoned buyers advocate and have a buy side agent that represents only your interests. You can even check “buyer’s agent” on the NY State Agency Disclosure Form. However, this does not mean your buyer’s brokerage needs to be so extreme as to ban working with seller clients altogether. In the off chance that you become interested in one of your buyer brokerage’s exclusive listings, you and the seller would simply agree to dual agency or dual agency with designated sales agents. Note: It is optimal to work with one of our mid-sized partner brokerages which has a good number of sell side listings, but not so many where you would likely run into a dual agency situation. Why Should You Have a Real Estate Buyer's Agent in NYC? The primary reason that you should have a buyers advocate is so you can discreetly receive a rebate of the buyer’s agent fee post-closing. A commission rebate is worth $20,000 or more in post-closing equity on your typical $2 million New York City home. However, as tempting as it is to sign up with the first discount broker offering a rebate that you find, it’s important to understand the importance of discretion in getting a rebate. The last thing you’ll want to do is to jeopardize your purchase by alerting the seller and the listing agent to the fact that you’re getting a better deal. In fact, there’s no better way to make a listing broker absolutely furious than to loop in a shady discount broker who openly advertises rebates. It’s not exactly difficult for even your most simple listing agent to find out what your typical mom and pop rebate broker is up to. All they have to do is Google the name of the unfamiliar rebate broker you looped in. What do you think they’ll do when they figure out what’s going on? Do you think the listing broker is going to meekly give away half his paycheck to someone who they perceive as cheating and hurting the industry? Unfortunately, your typical mom and pop rebate broker is more likely to hurt your chances of buying your dream apartment than help. That’s because most of these bucket shops are nothing more than barely licensed, fly by night operations based in someone’s apartment. They think that they can just step in and simply collect commission from hard working listing agents simply by advertising rebates online. Unfortunately, your traditional listing agent will not be so pleased and nor so willing to cooperate with someone like this. The listing broker will at the very least try to call up every other lead they have in order to shop your offer. The listing broker will make sure the seller knows you’re getting a better deal and will likely present your offer in a negative light. Furthermore, the seller may hold a grudge against your offer because he knows you’re trying a backdoor method of getting a better deal. This can often influence the seller to go with someone else out of pure resentment! The only way to find a buyers Realtor who will give you a discreet commission rebate is through Hauseit. Our partner brokers are all highly experienced, brand name, traditional real estate firms who never openly discount or tarnish their brands and reputations by openly offering to work for less. As a result, you truly get the real thing at a better price by working with a Hauseit affiliated buyers Realtor. Sellers and listing agents will not realize that you’re getting a better deal, and you’ll discreetly receive a commission rebate check after the closing is adjourned. 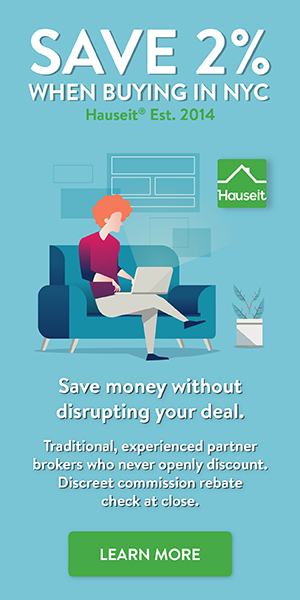 With a discreet commission rebate through one of Hauseit’s partner brokers, you can skip the embarrassment of having everyone at the closing table know you pulled a gimmick to get some of the commission for yourself. And that’s if your deal even went through in the first place!